An effective horse shampoo will give your pony a clean, bright, and shiny look. In contrast, a bad shampoo for horses is likely to cause hair loss, irritation and even allergy for your animals. Grooming is for the sake of your equine. You do not want your friend to get irritated after a bath, do you? That is the reason why you should read this article to choose the best shampoo for your horse. How To Choose The Best Shampoo For Your Horse? How Many Kinds Of Horse Shampoo Are There? 1. Should I use human shampoo for horses? 2. What do I need to groom my equine? 3. Do I need hair conditioner for my horse? 4. How often should I groom my horse? 5. Can horse shampoo promote mane and tail growth? When it comes to horse shampoo, the very first name to pop up in my mind is WARHORSE. Normally, pet hygiene products are produced for all pet animals. Very few manufacturers keep their only focus on less popular pets like horses. WARHORSE is one of them. That’s why I feel that they offer the best products for horses. Sunflower oil from non-GMO sunflower seeds contains a high concentration of vitamin E, which helps to create a clean and gorgeous hairy look. A perfect blend of plant oils from sweet almond, avocado to castor seed offers long-lasting benefits without irritating the skin. A big bonus of WARHORSE is the unique sweet-and-sour scent extracted from lemongrass, tea tree, lavender. No sulfates, parabens and dyes. No artificial fragrance. This is absolutely the most gentle horse shampoo out there. You can use it on the most sensitive skin with no worries. WARHORSE shampoo and conditioner will comfort your equine with its subtle cleansing ability and its adorable smell. This equine shampoo and conditioner are both natural and effective. WARHORSE works best on horses with dry skin. Because of its great moisturizing effect, your horse’s skin may feel a bit sticky, thereby attracting more dust. Then, you will have to wash her or him more often. Though no one wants it, your horse will have to suffer from skin lesions sometimes. You can enhance the skin conditions of your horse now thanks to Dechra DermaBenSs shampoo with the formulation of 2.5% Benzoyl Peroxide. DermaBenSs Shampoo is useful in treating common skin lesions such as hot spots, seborrheic conditions, lick granulomas, staph infections and other bacterial infections. It is also suitable for follicular flushing and degreasing. Despite containing drug chemicals, Dechra DermaBenSs Shampoo still has moisturizing effect thanks to some ceramides, antioxidants featured in the formulation. Therefore, it is still a wonderful moisturizer for normal use to restore dry or damaged skin. The biggest demerit of Dechra DermaBenSs is the high price. Due to its special ability in treatment, you are supposed to pay quite a lot for a horse shampoo. However, if your equine is having skin problems, this is still my recommendation to help him or her feel at ease. Do you want to bring out the best hair color out of your horse? 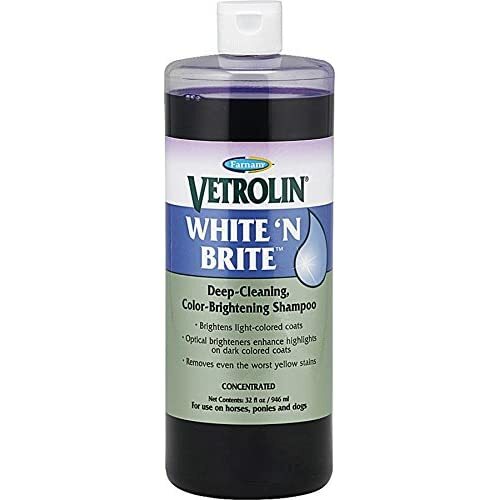 This Vetrolin White ‘N Brite will help. In addition to deep cleaning, Vetrolin promotes the radiance of the pets’ coat thanks to the optical brighteners. These substances play a role in reflecting light off the hair, making it look soft and shiny. Buying Farnam Vetrolin can be a very saving option because the product has a concentration formula. It means that you just need a small amount, about 2-4 capfuls with 2 gallons of water, for each time you groom your horse. When my horses get dirty, I always apply the liquid directly onto the stain, leave for a few second, add water and rinse thoroughly. This is the best way to remove spot. This shampoo has a deep purple color. So when it gets on your grooming tools, it may leave a blurry mark. To avoid this, wash your brush, comb or any involved tools right after bathing your horse. A more cost effective option for your horse than Dechra is Vetericyn FoamCare. 1% Ketoconazole in the ingredients provides healing relief for fungal disorders, which cause itchy, dry, scaling, and irritated skin. With healthy ingredients, no sulfates, no harsh chemical dyes, no paraben inside, Vetericyn delivers a deep conditioning clean, yet retains essential oils necessary for pH optimization. Hence, you should use it to help your horse avoid skin issues. Unlike other products, this horse shampoo comes in foam texture with a spray. I find it super useful when I want to clean a certain area of my horse. You just need to spray on exactly where you want, lather out and rinse. The main problem of Vetericyn is the unfriendly smell. It’s because the product contains anti-inflammatory and hypoallergenic ingredients to help soothe your horse’s irritated skin. No harmful chemicals in it, though. I don’t say that products from other nations are not good but the US is always prestigious for strict regulations on pet commodities. This Pet MD is 100% USA made so you can totally trust its quality. This shampoo seems to resolve all kinds of harmful skin conditions of horse. It removes bacteria and yeast, commonly known for causing hot spots, acne, ringworm. The best thing is you just need to pay an average price for a quality product. Besides horses, Pet MD can be used on cats and dogs. It is of great use for insect bites, superficial cuts and abrasions which not only horses, but also cats and dogs have while playing outdoor. Though it’s not a big problem for me but I find it quite difficult to lather the shampoo. This may result in residue after rinsing. To be honest, it depends greatly on you and your horse to define the best horse shampoo. What do you want your equine look like? Which color is your horse? Does your horse have itches or light cuts or insect bites? Below are some primary factors for you to consider. Normal skin without any infections is suitable for all types of horse shampoo. Nevertheless, if your pet is suffering from some skin ailments, you will need to apply medicated shampoo. Horses can be very dynamic and get dirt all over their bodies. Thus, you should have a spot cleaner, usually with a spray, to effectively remove big-headed stains before giving your horse a full bath. This is the case when you want to show off the beauty of your equine. Go for horse shampoo with blue and purple qualities to balance out the tone, reflect the light, finally, create a brilliant finish to your horse. There are a number of ways to categorize horse shampoo. But to the best of my knowledge and the most common categorization in my opinion, there are two basic types of horse shampoo. You can find a lot of brands for this type. But remember to choose the one with as much natural ingredients as possible. The main purpose of daily shampoo is to keep your horse’s mane and tail clean, smooth. As I said before, when the horse skin has lesions, you should look for antibacterial and antifungal shampoo. It supports healing process by soothing the irritated skin and promoting the healthy coats. It is possible to use human shampoo for horses because we share the same pH degree. However, I will not recommend it due to the fact that many human shampoo contains parabens, sulfates, which is harmful for your pet in the long run. A gentle horse shampoo, rubber curry, mane and tail detangler, sweat scraper, towel, hose, sponge, and bucket of water are basically all the thing you need to groom your horse thoroughly. It is up to you. Some horse shampoo actually has the conditioning effect but if you want to go a bit extra for special occasion, it’s fine. But remember that too much moisture can attract dust. So you may not need hair conditioner for your horse every time you give him or her a bath. The answer is based on the horse’s activities. If he or she is ridden every day, a bath after that will get rid of the dirt and sweat. Otherwise, just brushing your horse is enough. As far as I know, a thin mane and tail is a genetic problem, so horse shampoo has nothing to do with hair growth. If you use the right product, the best thing it can do is to prevent hair loss. To sum up, I have given you my list for the best horse shampoo. For normal use, I will definitely choose WARHORSE. Simple but effective. And at a reasonable price. For special skin condition, you may have to pay a bit more for medicated horse shampoo. Bathing is not enough for your horse. Giving him or her an absolutely good care involves more than just a bath. You may think of supplement to strengthen their joint or find out what food is good for your equine. You can count on https://horseislove.com/ for a comprehensive source of information on everything about horses.